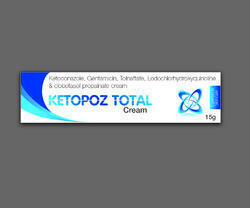 Providing you the best range of diclofenac linseed oil gel, ketoconazole iodochlorhydroxyquinoline tolnaftate gentamicin, ofloxacin ornidazole terbinafine cream, clobetasol neomycin and miconazole ointment and luliconazole cream with effective & timely delivery. Diclofenac works by blocking the effect of chemicals called cyclo-oxygenase (COX) enzymes. These enzymes help to make other chemicals in the body, called prostaglandins. Some prostaglandins are produced at sites of injury or damage causing pain and inflammation. By blocking the effect of COX enzymes, fewer prostaglandins are produced, which means pain and inflammation are eased. 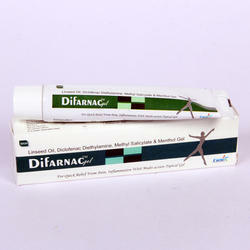 The linseed oil helps in the penetration of the diclofenac through the skin. Methyl salicylate also acts as an analgesic and menthol gives relief due to its cooling effect. This medication is an anti-fungal agent, prescribed for jock itch, athletes foot and other infections. It interferes with the formation of the fungal cell membrane and kills fungi. Stopping the growth of fungi. Killing the infection causing bacteria.